"HI-VIZ" SERIES 1000 POWER TAPE Blade Length: 8 m Blade Width: 25 mm Blade Style: A9 Measuring System: Metric Increment @ Scale: 1 mm @ 1 dm No. of Scales: 1 Blade Material: Steel Blade Finish: Yellow Clad End Type: Hook w/Burr Color: Orange Mounting: Belt Clip Hi-Viz case - easy to find on the job Case designed to fit perfectly in the hand Lightweight, high strength case Fits easily i.. Features: Safe, non-contact temperature measurement. Laser indicates approximate center of the target area. Displays temperatures in either Fahrenheit or Celsius. Auto power off for longer battery life. Easy-to-read backlit display for use in low light conditions. Accessories included: (1) 9V battery and carrying case. Lifetime Limited Warranty ..
Black markings on yellow, with red stud center markings every 16 inches. Measurements are marked on both sides and both edges, graduated to 1/16th inch. Engraved graduations on both sides. Strong, 6' (183 cm) long hardwood rules with clear abrasion-resistant coating Black markings on yellow, with red stud center markings every 16 inches. Measurements are marked on both sides and bot..
Klein 9056 Wood Folding Rules - with Extension Strong- 6' (183 cm) long hardwood rules with clear abrasion-resistant coating Black markings on yellow- with red stud center markings every 16 inches Measurements are marked on both sides and both edges- graduated to 1/16th inch Riveted lock joints are designed for long wear and maintained accuracy Engraved..
Klein Magnetic Tip, Nylon-Coat Steel Tape, Power-Return, 25' X 1"
Features: Rare Earth magnetic tip sticks to iron and steel surfaces for simple one-person measurements. (Note: Magnetic strength will vary with different types of metal surfaces.) Comfortable, non-slip rubber jacket for easy gripping case. Thick rubber jacket protects case against fall impacts. Convenient two-step lock button – 1st step slows retraction of the blade; 2nd step holds the blade.. Features: Hi-Viz ® case - easy to find on the job Lightweight, high strength case designed to fit perfectly in the hand Fits easily into most tape holsters Bright yellow blade has clear easy-to-read numerals Toggle lock is positioned for convenient operation Holds the blade securely in any position Virtually unbreakable Quad Ho.. Features: Ny-Clad® blade coating extends blade life 5 times longer than standard Patented end hook lasts 10 times longer than ordinary end hooks Non-slip toggle lock allows complete control of power tape blade Rubber cushion shell protects tape from impact and improves grip Compact size for comfort and easy storage. Removable belt clip Blade style: A5 .. Product Features: Open four-arm frame design protects blade, does not trap dirt in case Lightweight but strong case is easy to handle and rewind Two-material grip is comfortable to use Hi-Viz® orange case is easy to find on the job site Folding end hook for true-zero measurments Engineer's b lade - 10ths and 100ths of feet plus feet Yellow clad fiberglass blade impervious.. Product Features: Open four-arm frame design protects blade, does not trap dirt in case Lightweight but strong case is easy to handle and rewind Two-material grip is comfortable to use Hi-Viz® orange case is easy to find on the job site Folding end hook for true-zero measurments Engineer's blade - 10ths and 100ths of feet plus feet Yellow clad fiberglass blade impervious t.. Features: The open four-arm frame is designed to protect the blade, and eliminates occurrences of dirt getting trapped in case The lightweight but strong case is easy to handle and rewind The grip is made from two-materials which makes it comfortable to use The Hi-Viz® orange case is easy to find on the job site even at dusk Utilizes a folding end hook so you can get a t.. The Lufkin PSMW38 Pro Series Contractors Measuring Wheel (8ths Increments) is ideal for uneven terrain, curved horizontal and vertical surfaces. Ideal for real estate work as well as layout work. Pro Series model has a wheel brake and the rest at the handle for convenient multiple measurements. Retractable handle adjusts for comfortable measurements. Dial indicator measures.. 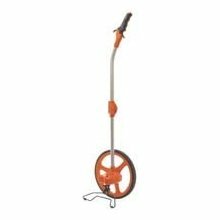 Features: Measuring wheel has a circumference of 4-ft Perfect for heavy construction, large commercial operations, utility companies, land surveying, and other critical measuring applications All steel construction Measures in 1-ft increments for surveying Complete with wheel brake and stand Limited 5-year warranty t of Measurement: Feet / Inches / Tenths of Feet .. Description: Positive blade lock with no creeping. Slide lock up front for easier operation. Takes standard replacement blades or complete replacement cartridges (inch rules only). Life Guard yellow blade, protected with Mylar to reduce friction; is easy to read and takes more abrasive wear than other blades. Graduated in 16ths on both edges of one side. Stud marking every 16". Data tables incorp.. Description: This 16 ft. tape measure is made of durable Mylar polyester film for extended blade life. The forward blade lock makes locking and unlocking a cinch, and the chrome-plated ABS case resists high impact. A Tru-Zero hook slides to accommodate both inside and outside measurements, helping the end user avoid errors caused by the thick hook. Features: Stud markings at 16 in. an.. Description: The Stanley 25-Foot FatMax Tape Measure is reinforced on the first six feet with BladeArmor coating for maximum durability. A Mylar polyester film extends the life of the entire blade. This tape rule comes with a cushion grip built into the case for a non-slip grip and impact resistance. A top forward blade lock design makes it easier to lock and unlock the blade while a heavy, heat-.. Description: The Stanley 25-Foot Powerlock Tape Rule provides positive blade lock without creeping while taking measurements. A special Tru-Zero hook does double-duty as a pivot for drawing circles and arcs, and a three-rivet, corrosion-resistant hook moves for accurate inside and outside measurements. The tape blade measures 25-foot-by-1-inch with a 11-foot tape standout. Fea.. Description: The Stanley 30-Foot FatMax Tape Measure is reinforced on the first six feet with BladeArmor coating for maximum durability. A Mylar polyester film extends the life of the entire blade. This tape rule comes with a cushion grip built into the case for a non-slip grip and impact resistance. A top forward blade lock design makes it easier to lock and unlock the blade while a heavy, heat.. Description: The Stanley 30-Foot Powerlock Tape Rule provides positive blade lock without creeping while taking measurements. A special Tru-Zero hook does double-duty as a pivot for drawing circles and arcs, and a three-rivet, corrosion-resistant hook moves for accurate inside and outside measurements. The tape blade measures 30-foot-by-1-inch with a 7-foot tape standout. Features:.. Description: The Stanley 35-Foot Powerlock Tape Rule provides positive blade lock without creeping while taking measurements. A special Tru-Zero hook does double-duty as a pivot for drawing circles and arcs, and a three-rivet, corrosion-resistant hook moves for accurate inside and outside measurements. The tape blade measures 35-foot-by-1-inch with a 7-foot tape standout. Features:..
SPEEDMARK SELF-LOCK TAPE MEASUREFeatures a unique self locking mechanism that -allows the blade to extend smoothlyPush button retrieval insures control when -retracting the bladeEasy to read fractional graduation measurementsNylon coated blade for maximum durabilityRubberized grip caseSIZE:1" x 25 Ft.COLOR:Black/Yellow..
MONSTER MAGGRIP TAPE MEASURERubberized grip case tapeLarge, flared, magnetic dual end hookMeasurements printed on both sides:Horizontal graduations on front - with -vertical graduations on backNylon coated bladeSIZE:1" x 16 Ft.COLOR:Green/Black..
MONSTER MAGGRIP TAPE MEASURERubberized grip case tapeLarge, flared, magnetic dual end hookMeasurements printed on both sides:Horizontal graduations on front - with -vertical graduations on backNylon coated bladeSIZE:1" x 25 Ft.COLOR:Green/Black..
MONSTER MAGGRIP TAPE MEASURERubberized grip case tapeLarge, flared, magnetic dual end hookMeasurements printed on both sides:Horizontal graduations on front - with -vertical graduations on backNylon coated bladeSIZE:1" x 30 Ft.COLOR:Green/Black..
GRIPPER X TAPE MEASUREUltra compact rubberized tape caseLarge read scale fractional graduations30% large read numbers than most tape rulesNylon coated bladeGraduations are printed on both sidesSIZE:1" x 25 Ft.COLOR:Orange/Black..
YELLOW ABS CASE POWER TAPEErgonomical design fits comfortably in handDurable ABS construction caseNylon coated blade resists abrasion & wearSlide lockShock absorber helps to protect blade tipSIZE:3/4" x 16 Ft.COLOR:Yellow..
YELLOW ABS CASE POWER TAPEErgonomical design fits comfortably in handDurable ABS construction caseNylon coated blade resists abrasion & wearSlide lockShock absorber helps to protect blade tipSIZE:1" x 25 Ft.COLOR:Yellow..
TRADESMAN TAPE MEASUREEconomically priced high-quality tape measureAcrylic coated high carbon steel bladeDurable ABS caseTriple-riveted end hookSIZE:1" x 25 Ft.COLOR:Orange..
OPEN REEL FIBERGLASS TAPE MEASUREDurable ABS frame open reel fiberglass tapeGraduated by feet and inchesUniversal end hookDouble coated fiberglass bladeRubber hand gripSIZE:1/2" x 100 Ft.COLOR:Yellow..
OPEN REEL FIBERGLASS TAPE MEASUREDurable ABS frame open reel fiberglass tapeGraduated by feet and inchesUniversal end hookDouble coated fiberglass bladeRubber hand gripSIZE:1/2" x 200 Ft.COLOR:Yellow..
OPEN REEL FIBERGLASS TAPE MEASUREDurable ABS frame open reel fiberglass tapeGraduated by feet and inchesUniversal end hookDouble coated fiberglass bladeRubber hand gripSIZE:1/2' x 300 Ft.COLOR:Yellow.. MIGHTY MITE COMPACT TAPE MEASURECompact chrome case power tapeNylon coated 1" wide bladeCase has large grooves for easy grippingPositive lock holds blade position securelyInternal mechanism provides smooth operationSIZE:1" x 25 Ft.COLOR:Chrome..
ALUMINUM STRAIGHT EDGE RULERAluminum alloy - heat treated on one sideCan be read from either endMarked 1/16" and 1/8" incrementsSIZE:2 x 48"..
ALUMINUM YARDSTICK1/16" & 1/8" incrementsSpecial tempered aluminum alloyHeat treated & flexibleHand-hole, straight & parallel edges.075" thick x 1-1/8" wideAnodizedSIZE:36"DESC:Printed 1 side..
BLUE STEEL RAFTER SQUAREPermanently etched markingsRafter framing ruleOctagon scaleBrace measureEssex board measure1/16" - 1/8" graduationsSIZE:16 x 24".. DEGREE METERAccurate degree readingsCompact design.. RAPID SQUAREFor rafter layoutPrecision aluminum castingMeasures angles from 0 to 180 degreesSimple instructions included..
ALUMINUM RAFTER SQUARETables are imprinted with white or blackEasy board measure and reverse reading ruleSIZE:16x24"..
DRYWALL T-SQUAREAnodized aluminumPermanently set right angleEasy to read numbers1/8" marking on bladeFor layout work with drywall and other materialSize: 2 x 47-7/8 x 1/8" blade thickness.. COMBINATION SQUARESZincEasy to read graduationsSteel scribes includedLevel vial in headSIZE:6".. COMBINATION SQUARESEasy to read graduationsSteel scribes includedLevel vial in headPlastic headSIZE:12"..
STANDARD SQUARE1/8" and 1/4" graduationsPermanently etched markingsPolished steelNo weldsSIZE:16 x 24"..
POLISHED STEEL SQUARE1/8" & 1/4" graduationsFeatures wood screw drill sizesBoard foot table & useful informationPermanently etched markingsPolished steelNo weldsSIZE:8" x 12".. HOMEOWNER'S SQUAREPermanently etched markingsNo weldsNo tables included1/8" & 1/4" graduationsSIZE:16"x 24"DESC:Aluminum..
ALUMINUM STRAIGHT EDGEQuality extruded aluminumEasy to read numbersWill not rustSIZE:2 x 72"..
ALUMINUM YARDSTICK1/16" & 1/8" incrementsSpecial tempered aluminum alloyHeat treated & flexibleHand-hole, straight & parallel edges.075" thick x 1-1/8" wideAnodizedSIZE:36"DESC:Printed 2 sides..
T-BEVEL PLASTIC HANDLEUseful for angles and layoutEasy to read graduationsVery versatile.. ANGLE STAIR GAUGESet square at proper stair angleEasy to use2 per pack.. HOMEOWNER'S SQUAREPermanently etched markingsNo weldsNo tables included1/8" & 1/4" graduationsSIZE:16"x 24"DESC:Copper..
DRYWALL T-SQUARESilver anodized finishBlack epoxy painted numerals for long wearNotched head, reverse rulings & stud markingsAllows for quick, accurate cutsAircraft style rivets secure bladesMade in the USASIZE:54"..
SWANSON BLUE BOOKUse for roof & stairway layoutsIncludes tables & diagrams of the following:Common hip, valley, & jack rafters..
SPEEDLITE LEVEL SQUAREFrames entire roof using one numberDiamond cutout is handy for seat cutsProvides a quick reference to 2 x 4" widthFull 0 to 90 degree scale for measuring anglesHandy saw guide for cutting anglesSerrated edge makes scribing lines easyWith framing, try, miter & protractor squaresStrong aluminum alloy- 3/16" thickSIZE:7 x 7"..
RAFTER SQUAREPermanently impressed graduationsMade of high grade aluminum alloyRafter, brace & Essex tablesOctagon scaleThermal powder coatingSIZE:24"..
SPEEDLITE HI-VIS SQUAREFlexible, lightweight plasticHigh visibility 5 in 1 squareRaised scale markingsYellow and orange fluorescent markingsSIZE:8x 8x 11".. MAGNETIC SQUARE2 alignment marks for 2 different positionsWide back designSticks to side of metal stud or grid work.. SPEED SQUAREAluminum alloy constructionIncludes rafter tables & conversion chartsInstruction booklet includedS0107 also used for laying out stepsSIZE:7".. SPEED SQUAREAluminum alloy constructionIncludes rafter tables & conversion chartsInstruction booklet includedS0107 also used for laying out stepsSIZE:12"COLOR:..